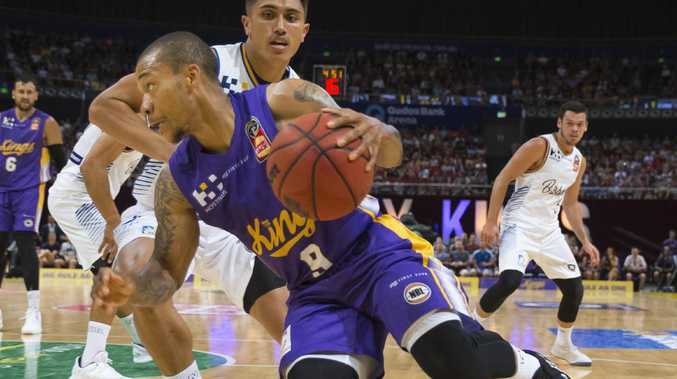 THE Sydney Kings will head into the New Year on top of the NBL ladder for the first time in over a decade following a 75-68 victory against the Brisbane Bullets. The Kings haven't led the league at this point of the year since the 2007-2008 season. But inspired by the league's best one-two-punch - Andrew Bogut and Jerome Randle - Sydney are standing at the NBL's Everest. Bogut and Randle finished with 14 and 17 points respectively while they combined for a beautiful alley-oop dunk in the first quarter of Saturday night's showdown. 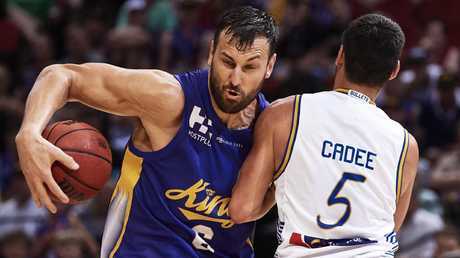 Bogut also added 12 rebounds, five assists and four blocks in another first-class display to enhance his MVP chances. The former NBA champion was at his best when it mattered most in the closing stages with a crucial block and four points to deny the fast-finishing Bullets. Kings coach Andrew Gaze was pleased with the strong team effort but reserved special praise for Bogut. "Without Bogues we don't win that game," Gaze said. "It was the rim protection, the passing. He may have produced statistically better games but that was one where he carried us a bit in the crisis when we needed some points down low." 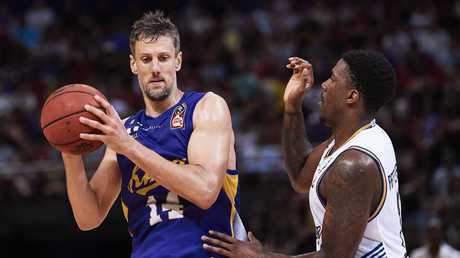 Brisbane coach Andrej Lemanis was also in awe of Bogut's dominant performance. The Bullets and Boomers mentor believes the 13-year NBA veteran is right in contention for MVP honours. "Absolutely - if you truly appreciate the game - how he influences it is not often reflected in any particular stats," Lemanis said. "It is reflected in team stats and Sydney have gone from the worst effective defensive field goal percentage team in the league to this year being by far the best. "When people asked me at the start of the year what impact Bogut would have on this league, I said it will be different to what you are expecting. "He is not going to have 20 points every game but what he will do is help them defensively and teams will struggle to score and that has proven to be true. "He also has a weight of personality to be able to get them (Sydney) as a collective and moving in the right direction together. "So in terms of someone having an overall impact on a team that is positive, if that is your definition of an MVP, then absolutely he should be in the discussion." Bogut was humbled when asked about his MVP prospects but swiftly made his team-first ambition crystal clear. "I'll take a championship over the MVP," Bogut said. "It would be great, cool if I got it but I'll take a championship over all the other stuff." Bogut was more than happy to talk up Sydney's remarkable turnaround in defence. The Kings continued their league-best form on the defensive end to restrict the Bullets to just 68 points. Bogut couldn't be prouder of his team's effort without the basketball. "It is a huge improvement," he said. "They (Brisbane) didn't score 20 points in any of the quarters. I goal is usually 18, so that is huge." Back-up guard Kyle Adnam was the unsung hero for the Kings with 10 points off the bench, including two of four from beyond the arc. Veteran swingman Brad Newley added eight points while NBA hopeful Brian Bowen Jr finished with seven. Bowen also produced a number of pretty dunks to do his 2019 Draft prospects no harm. 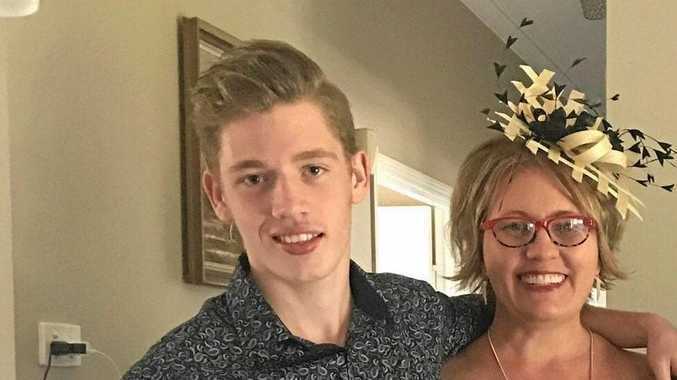 Former King Jason Cadee had a mixed homecoming, finishing with eight points for the Bullets. Importantly after last week's capitulation against Melbourne, the Kings executed down the stretch with Brisbane surging home. The Kings will look to build momentum when they take on the Hawks in Wollongong on Saturday. SYDNEY KINGS 75 (J Randle 17 D Kickert 12 A Bogut 12) BRISBANE BULLETS 68 (L Patterson 20 C Bairstow 17 J Cadee 8) at Qudos Bank Arena.